Brian Vickers finished eighth in Saturday night’s NASCAR Sprint Cup Series race at Texas Motor Speedway, battling throughout the 334-lap event in the #11 FedEx Office/March of Dimes Toyota to score the team’s third top-10 finish with three different drivers in the 2013 season. Vickers benefited from a timely caution on Lap 282 just before he was to make a green flag pit stop from third place after many cars in front of him had already come down pit road for service. He was able to pit during the caution and restart fifth after spending the previous run just outside the top-15. One more caution bunched the field with less than 20 laps remaining, and Vickers took the checkered flag eighth behind race winner Kyle Busch. Vickers started 15th in the special FedEx Office/March of Dimes paint scheme, and quickly worked himself into the top-10 in the opening laps. He was one of the fastest cars in the first run as he moved into the top-five, but developed a loose condition on corner entry that nagged him throughout the race. A series of chassis adjustments on pit road tried to tighten the car up as the track temperature dropped, but nothing seemed to bring the car to life. Quick stops by the FedEx crew helped gain track position every stop, and Vickers searched around the 1.5-mile oval for a racing line that optimized the car’s performance. The finish by Vickers is the third top-10 of the year for the #11 team, following a 10th-place result by Mark Martin last week at Martinsville and a third-place run at Phoenix by regular driver Denny Hamlin, who is currently sidelined with an injury. The #11 team moved up one spot to eighth in the NASCAR owner’s standings after Texas, 54 points behind the #48 after seven races this season. Vickers will make his second start in the #11 FedEx Freight Toyota Camry this weekend at Kansas Speedway. The FedEx Racing team returns to the 1.5-mile track as the defending race winners, with Hamlin guiding the car to victory lane one year ago. He led 32 of 267 laps from a fourth-place starting position for his second win of the 2012 season. Vickers is making his eighth career Cup Series start at Kansas this weekend. In seven previous trips to the track, Vickers has one top-10 finish, an eighth-place result in 2006. He has qualified in the top-10 in three races at Kansas, including fourth in 2006 and 2011, his last race there. 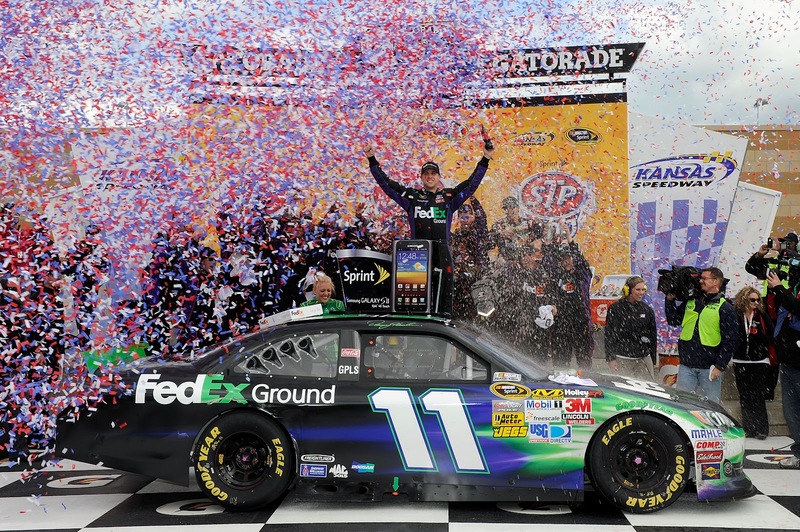 The FedEx Freight service center in Des Moines, Iowa, will be recognized for outstanding performance with its ‘DSM’ code letters on the b-post of the #11 FedEx Freight Toyota this weekend at Kansas Speedway. 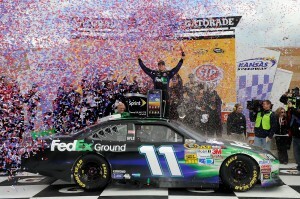 How do you feel heading to Kansas after the results after the first Cup Series race with JGR? How has it been working with JGR on the Cup side?